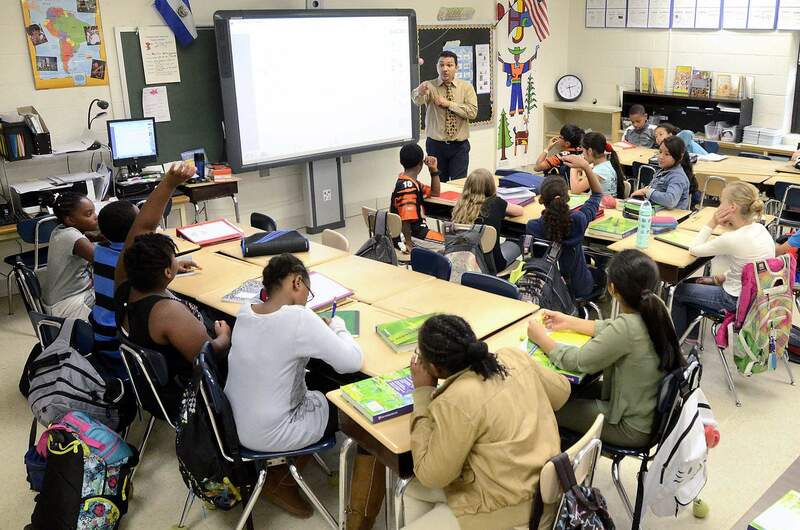 In recent years, Florida teachers, parents and others have filed thousands of complaints about the indoor air quality in schools caused primarily by mold. Runny noses, allergic itchy eyes, headaches and respiratory distress on mold discovered throughout schools is at the root of the problem. Mold is a naturally occurring part of Florida’s warm, humid climate so it’s only natural it finds its way in schools. Mold spores continually flow through the air indoors and outside and most types of mold are harmless. Mold spores need three things in order to grow: moisture, nutrients, and warm temperatures. Warm and humid weather provides excellent conditions for mold to grow which is no wonder why we have more mold problems in Florida than in cooler and drier states. Roof leaks, lack of maintenance and damage by hurricanes or strong storms in Florida have contributed to more instances of mold in Florida schools. Everyone is exposed to some amount of mold on a daily basis, most without any apparent reaction. Since mold is present everywhere, and humans are exposed to mold every moment of their lives, the effects of mold on an individual will vary greatly depending on their personal health. Respiratory conditions such as asthma, susceptibility to allergens, immune system deficiencies, etc., are all factors that will impact the effects of mold on a given individual. Generally, toxic reactions to mold are not common in healthy individuals. While mold often causes health hazards, the mere visual presence of mold does not mean problems will occur. The spores of the mold must be released into the air and ingested or inhaled for a reaction to take place. Typically, mold spores cause more problems when there is active mold growth present in large numbers. The most common symptoms reported from mold in indoor environments are runny nose, eye irritation, cough and congestion, aggravation of asthma, headache, and fatigue. The production of potentially toxic mycotoxins can cause more severe reactions, and in rare cases, deaths have occurred. Since Florida’s humid and wet climate are ideal for mold growth, along with Florida’s large number of schools it’s only natural to expect mold in just about every school. This doesn’t mean having mold, since it’s everywhere is a problem, it only becomes a problem if not addressed and continues to grow. In the last decade there are questions and concerns of how Florida’s schools district are dealing with mold issues as they become known. For example, in 2003, a grand jury blasted the Broward County school system for taking too long to get rid of mold in classrooms and failing to repair leaky roofs and faulty air conditioners. The panel outlined its concerns in their report and strongly recommended changes the State of Florida needed to make to force school districts to improve air quality in schools, while underscoring that children were especially vulnerable to the potentially harmful effects of mold spores. Unfortunately, South Florida lawmakers who introduced bills in 2004 went nowhere, as it was pointed out Florida would be setting itself up for lawsuits if progress reports addressing mold and air quality problems were made public. According to an Orlando Sentinel investigation, and years after the grand jury report, Florida schools continue to battle chronic mold and water-intrusion problems. The challenge is, mold problems don’t go away, and they just get worse. Abatement is expensive, and mold is so pervasive it is can be in air ducts, behind drywall, under carpet or caused by faulty HVAC systems which blow mold spores throughout the school. In some cases you would have to strip the walls down to the studs and take out the insulation, but still you might not completely get rid of the mold. Some school districts are addressing the issue up front and allocating funding to improve air quality and remove mold where it’s found. However, some districts have tried to save cost by adjusting the temperature as their solution to a mold problem. This might be a temporary fix, but it’s really just “kicking the can down the road”, as it doesn’t solve the problem. Budgetary shortfalls have slashed funding for school maintenance and renovations during the past several years which has further exacerbated the mold problem in Florida’s schools. If school officials do have perform environmental tests which prove positive for mold then a cleanup must ensue, so some schools have taken the stance not to do the test which would require abatement to fix the problem. Researchers at the University of Central Florida, who discovered in a 2006 study that schools in Florida and some other states are chronically moldy and humid, have said that without substantial funding increases for maintenance, the situation will not improve much. Tallahassee attorney Mark Levine, who has represented school employees in mold-related lawsuits, said the root of the problem is fourfold: poorly trained maintenance workers, long-neglected buildings, air-conditioning systems that were not designed for Florida’s weather and administrators who are slow to acknowledge problems. Add to that lack of funding and you’ve created a perfect storm for increased instances of mold. Levine said, doctors have testified in court that school officials have refused to order environmental tests to help decide whether employees with respiratory distress could go back to work. With funding for school systems limited, and mold abatement expensive schools are looking at alternatives which are cost-effective and help solve their mold problem. School systems are now looking into an old technology, UV-C lighting, but with a new twist on it. UV light (ultraviolent) was actually first used as therapy in the late 19th century to treat patients with lupus, TB and sepsis. Ultraviolet radiation can eliminate or reduce pathogens floating in the air. This process is called air ultraviolet germicidal irradiation, or UVGI. UVGI is an important technology and now used in many hospitals, research centers, and laboratories where contamination with bacterial and fungal spores poses a serious health risk. The UVGI systems in hospitals are used in HVAC systems (in-duct) and there are also mobile units. Mobile UVGI systems are rolled into patient rooms to disinfect before and after patients are assigned a room. Of course, this wouldn’t be practical school classrooms, but a new system which combines air filtration with UV-C and photocatalytic oxidation (PCO) is getting the attention within Florida school districts as a cost-effective option to mitigate mold. Installed unobtrusively in ceilings, this type of system constantly disinfects the air by forcing air through a chamber which gets treated by UV-C light. The air passes through a filter first which stops larger particles and contagions while allowing microorganisms to continue through which then are exposed to a UV-C lamp which instantly kills them. This type of system has proven to reduce pathogens by 97% on a first kill pass rate, and now is proven to be effective in killing mold spores. The system, called the “Purealizer” is becoming the perfect solution for ongoing mold fungi and other microorganisms. By utilizing a constant UV-C filtration system in each classroom, or area where mold has been discovered, Purealizer system will help minimize, if not entirely eliminate mold spores. Cost for these types of units vary, depending on size of the area which is protected. The Purealizer requires only minimal maintenance (once per year) minimal power and have proven to be very effective. This new type of system, using old proven UV-C technology might just be an affordable answer to helping keep Florida schools air quality both clean and healthy for students and teachers. Contact us for further information on UV systems to prevent and eliminate mold in classrooms.